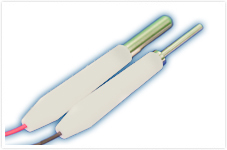 Standard Probes (Pair of 2 Probes) **Includes 1 small & 1 Large tip setOur standard probes are single channel probes used to treat smaller skin surface areas and for Iontophoresis. The standard probes are for all SX series facial machines & the Pico Toner. The tips for the single probes are interchangeable for various sizes.